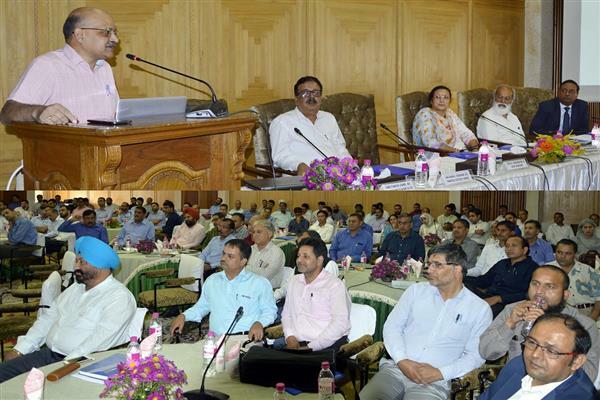 SRINAGAR, SEPTEMBER 12 (KNO) : Chief Secretary B V R Subrahmanyam today lauded the role of income tax department in the collection of taxes and bringing about efficiency, transparency and fairness in tax collection. He was speaking in a seminar organized by Income Tax Department to create awareness on TDS/TCS provisions of Income Tax Act 1961. Chief Commissioners of Income Tax Madhu Mahajan and Binay Kumar Jha, Principal Secretary Finance Navin Choudhary, Principal Commissioner RN Sahai, Commissioner Income Tax (TDS), Prakash Johri were also present on the occasion. Subrahmanyam said the governments are run on taxes and urged the citizens of the state to pay taxes for their own collective benefit. He said the taxes are collected by the government but reach back to the people in the form of facilities being provided by the government to them in the form of roads, buildings, healthcare, education and other facilities. He said more taxes will guarantee more welfare of the state and appealed the people to pay taxes regularly. He said TDS is a non-obtrusive but powerful instrument to prevent tax evasion as well as to expand the tax net. He said TDS also minimizes tax avoidance by the taxpayer as the payee’s transaction(s) are reported to the Department by a third person. He said the introduction of technology and more innovation in the tax collection process has made the department more user-friendly as the taxpayers can now pay their returns online while sitting in any part of the world. He said the state government has also put in place highly innovative and automated system in operation for hassle-free tax collection and filing of TDS returns. The Chief Secretary appreciated the income tax department for organizing the awareness workshop and emphasized on creating greater awareness on tax deducted at source (TDS) compliance.